This article is part of a multimedia series documenting renewable energy initiatives in Chile, "Fueling Cooperation" – crafted and assembled by Michelle Stearn for the Fulbright fellowship 2017. Images generously provided by AJA. I was speaking with Victor Albornoz, the founder and director of Bio Innova, a mid-scale facility that makes biodiesel from waste vegetable oil. Naturally, before arriving at the plant for a tour, I asked Victor how the petroleum prices were affecting his work. He made no mention of the full name of the implied culprit, the “they” indicative of the country where I was born: the United States of America. We were 5,369 miles from there as the crow flies, in Temuco, in the Araucanía region of southern Chile, but I still knew clear as day what “they” meant. You might be thinking, what do U.S. military actions in the Middle East, and specifically the “mother of all bombs” dropped April 21, 2017 on Afghanistan, have to do with this mid-scale vegetable oil recycling plant? The answer is this: everything. Without diving into a bottomless pit of financial analyses to prove a correlation between war and oil prices (more on that in my upcoming articles), what we can glean from Victor’s comments is an organic understanding that armed conflict and tension leads to uncertainty in the petroleum industry. Most consumers would be excited for oil prices to stay down, but when you’re a producer of an “alternative” fuel like Albornoz, the relationship with fuel prices is inverse: when petroleum prices are high, renewables win. Like a telescope contains a series of mirrors that reflect the light from years past for the naked eye to see, my exploration of the biofuel industry in Chile has blossomed into a mosaic of reflections on the history of fuel. How can we get from point A to point B using this archaic infrastructure that burns liquefied dinosaurs and incites countless wars to transport humans and inanimate objects? The global economy as we know it took its monstrous shape with the advent of petroleum over the last century; now to dismantle this system it seems we are flailing around wildly for the keys to a new vehicle for change. With respect to alternative fuels, my research on the ground from Washington, D.C. to Southern Chile has led me to believe that instead of attempting to invent a new system, many efforts are funneled into adapt the current one, just like Albornoz in Temuco, Chile. People are saying, with good reason: Let’s find something else, anything, to throw into those engines, of which we have produced over a billion globally (and that’s according to the 2010 data on registered vehicles). The resounding mantra that we’ve chanted, consciously or subconsciously, is this: Let’s burn whatever is cheapest. The price is right: or is it? In a way, producers like Albornoz are hearkening back to Dr. Diesel’s initial intention. Leave it to a 500% spike in oil prices from 2002 to 2008 for business owners and government alike to scramble for an alternative to petroleum. There was such a collective movement toward biofuel production, even I hopped on the bandwagon and embarked on endeavor to learn the process and start a biodiesel lab in Washington, D.C. and help with the one here in Chile via a Chicago-based non-profit. Funny enough, the U.S. Navy also announced a partnership with Chile to embark on their mutual goals of increasing renewable biofuel sources for maritime fleets. With prices so high, the door was wide open here in Chile for someone to corner the market. The transportation industry relies mainly on diesel fuel here in Chile, as buses run up and down Ruta 5, the main highway, like ants marching in a line towards the sugar bowl. The buses had their cargo, but suddenly businesses had to find a way to fill their own bowls. The Chilean government sure wasn’t much help, they invested $250 million USD as a capital contribution to its state-owned petroleum company, Empresa Nacional del Petróleo (ENAP) in 2008, according to an ENAP Investor Presentation. Not only that, the Chilean government “injected 700 million dollars into a fund that year to shore up fuel prices and made another $500 million available in case the price of oil continued to rise.” This paralleled the efforts in the U.S. to bail out the auto industries after the 2008 financial crisis. As economic analyst Adrian Hanni put it in his series, The Great Recession Was an Oil Crisis: “Governments all over the world reacted to the [2008 financial] crisis by throwing financial lifebelts to auto manufacturers and financial companies. The energy supply, on the other hand, received no lifebelt. Far too much was invested in the past instead of a sustainable future.” So families that rely on the transportation business take matters into their own hands. Knowing the scarcity of biofuel production in Chile, I can say that the most fortuitous of circumstances orbited Victor Albornoz at that moment. These more-than-ideal odds helped catalyze the creation of his endeavor, Bio Innova. Albornoz knew that he could would always have a client. His grandfather founded the "micro" bus system in Temuco, and many of his family members have jumped on the transportation caravan. So with the gleaming promise of a never-ending market as his own mental fuel, Albornoz soldiered through a 23-month business registration process (the municipality in his region had never before come across such an idea) to found Bio Innova, which now collects and processes between 8,000 and 10,000 liters of oil per month. Notice the key verb there is “collecting” the oil, not “producing.” Many academic studies and most mass-scale biofuel production in the world comes from first-generation feedstocks. According to a 2013 U.N. Food and Agriculture Administration report on Biofuels in Latin America, rapeseed oil and sunflower oil are “real options for the production of biodiesel in Chile” But the principal problem with these first generation feedstocks is that they are valuable fuel sources for humans, not just motors. The study cites research from the la Universidad Técnica Federico Santa María of Chile, which found that to abate the demand for biodiesel in Chile using those two feedstocks, the amount of land would not suffice to meet both the food and the fuel demands. Barring the moral debate that comes into play when we use first-generation oils to create biofuel, a genius alternative has presented itself in the form of kitchen grease, also known as waste vegetable oil (WVO). The process called transesterfication, which converts vegetable oils into diesel fuel, has been around since 1937. But this method wasn’t taken seriously until oil crises in the last 50 years and the growing preoccupation with what to do with a dwindling supply of petroleum. Not to mention conflicts arising today surrounding who claims ownership over the petroleum reserves—but that’s for another story). But Bio Innova avoids the whole moral dilemma by skipping the “virgin” oil step. Instead they recycle waste vegetable oil, playing an important role in the recycling chain of the entire region with over 113 restaurant accounts. In the process of obtaining these accounts, they have also served to educate the public about avoiding contamination by throwing WVO into the gutters and rivers, a practice that threatens to contaminate thousands of gallons of water with even a single liter of oil dumped. “Despite good crops,” and in this case, feedstock, “it is difficult to make the economics of biofuels work in a low oil price environment,” says Jonathan Kingsman in Oil price fall adds to biofuel’s woes. “For its survival the sector will have to depend on political support through legally mandated demand,” Kingsman continues. “The challenge for the sector will be to maintain that support. “ But with the price of oil low again, and government subsidies nowhere to be found, biofuel producers like Bio Innova are left without profit margins cushion-y enough to keep them afloat in the sea of government-subsidized and state-owned petroleum companies. In the U.S., this was a similar case for my intentions to build a lab—I was eventually priced out by the gentrifying Washington, D.C. area, paying $500 for a corner of a warehouse. There are a few exceptions to those priced out; canaries in the coal mine. 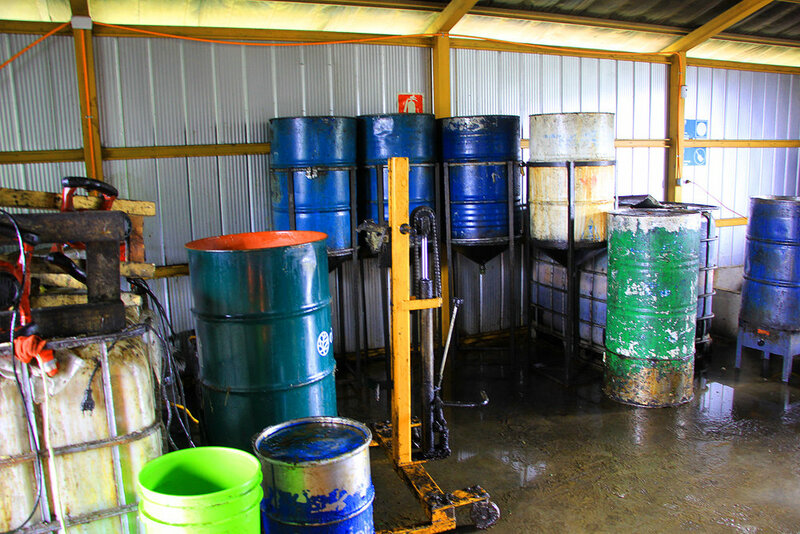 They are the biodiesel producers like Albornoz, whose facility is located on land that a family member lent him, and who deliberately choose mission over profit. I discussed Albornoz's vision during my in-depth interview at his facility. 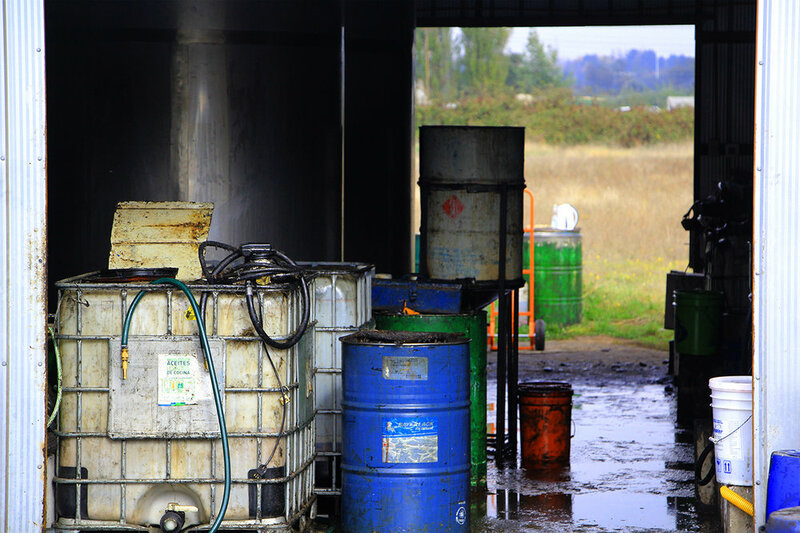 Why take on an endeavor such as biodiesel production? "The investment is high, the return is low [for biodiesel production]," Albornoz responds. "So one must look at the social factors that have an impact, that we prevent contamination, is something very important... It's not a project I take on for my personal ambition. Nor is it economical. It's more environmental." The true essence of Albornoz’s business has always been to produce biodiesel fuel, so he has continued with this mission despite the fact that it’s not as profitable as when oil prices were high. So how can we make oil prices reflect the actual costs of the industry? How could they encapsulate livelihoods - and even lives - lost in the search for petroleum? And how can we ensure that falsely low petroleum prices don’t hamper the growth of important new sources of renewable energy? These questions are enough to fill that 10,000 liter drum with ideas, which I’ll explore in upcoming articles. Some ideas come to mind after speaking with countless experts here and back in the U.S.: Remove government subsidies for oil; Provide incentives for businesses seeking to recycle oil; Fund studies that explore the uses of second generation oil for fuel production (the current research in Chile is being conducted on rapeseed oil, which as I previously mentioned, is up for debate due to land availability); Create new infrastructure around biofuels and away from petroleum consumption; and last but not least, Find ways to connect producers of alternative fuels with consumers. What do you believe is the true cost of oil? Is filling up your tank worth the bombing of a city? Would you get your hands greasy to create fuel for your car?